With the help of Infrared light, researchers are able to go in search of the small particles which shape and determine our lives. The phenomenon, in which infrared light sets molecules in vibration, is pivotal in this search. Scientists are exploiting this phenomenon by using infrared light to analyze the molecular makeup of samples. 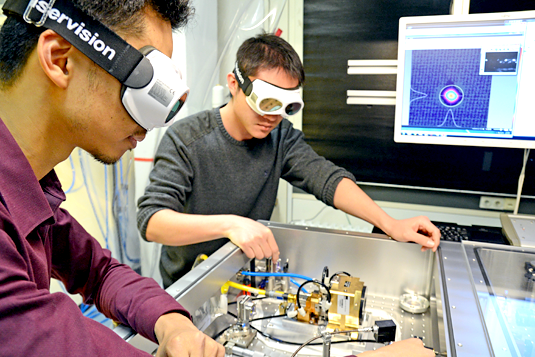 In the hope that this analysis can become even more exact, the laser physicists from the Laboratory of Attosecond Physics at LMU and the Max Planck Institute for Quantum Optics have developed an infrared light source that has an enormously broad spectrum of wavelengths. With this system researchers have achieved the broadest simultaneous infrared coverage from a solid state laser. Moreover, the infrared laser pulses emitted should correspond to a sub-cycle pulse in time domain.